The 7 Chakras is the Alphamusic healing, chakra meditation track recommended for individuals and therapists working with the chakras. The 7 Chakras track focuses on the seven most common chakras, the ones that affect your everyday life. These chakras are deep inside your body and Alphamusic helps them spin like a wheel in a clockwise direction. Have you ever noticed that when you reminisce about something good from your past, you may catch yourself smiling? Or perhaps you recall something that may have hurt or upset you and you find yourself feeling drained or sad? Your thoughts have the ability to control the energy that flows in and around you. According to Doreen Virtue, Ph.D, different energy centres within your body correspond to certain thinking habits. For example, if you are always concerned with money, these thoughts will be linked to a particular energy centre. These energy centres are more commonly known as chakras. Your body is filled with hundreds of chakras that dictate the flow of energy throughout your body. When healthy they should spin like a wheel in a clockwise direction, brightly and full of light. When you feel depressed, stressed or run down, your chakras become dirty and dark and have difficulty filtering through enough energy. When you pit aside worries and release your fears to universe, you will help your chakras to function to their full potential. 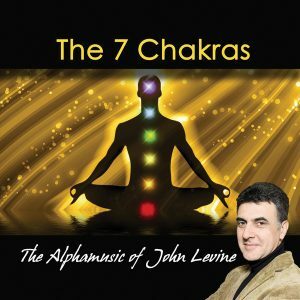 John Levine writes music that builds a Body/Mind Connection; and he does it so well! His music speaks with such gentle compassion that I am yet to hear from any other composer. As a Shiatsu Therapist I need to create a nurturing and comfortable healing space for my clients. Since I began to use his music in 2006, I feel that my treatments became more effective as it allows for greater relaxation and ultimately a greater sense of body awareness. To me everything is music. Its vibrational effect is the symphony I call life. John’s music is so beautiful. It allies with my profile, which is to open people up and is very healing and relaxing. I recommend John’s music to everyone who wants to incorporate meditation and relaxation, so I think it should be every single person on this planet! Just relax and go then to find something deeper within yourself. It is the best chakra meditation music.